Avira Prime basically cost 9.95 € per month for up to five devices, or 12.95 € per month for up to 25 devices, or yearly payments of 99.95 € / 129.95€ respectively. 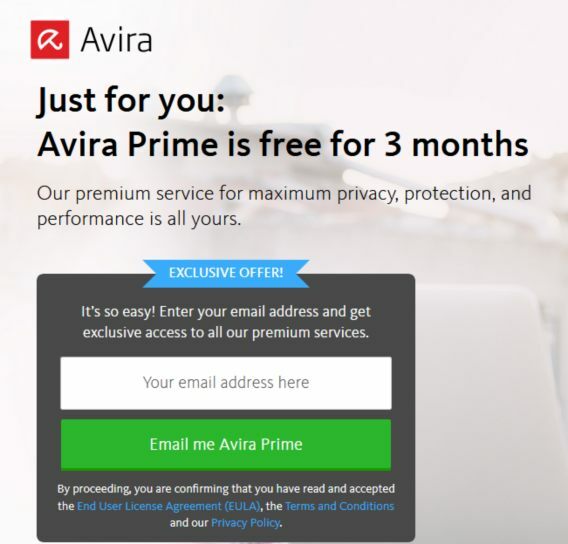 As part of promotional offer, everyone can grab the free 3-months subscription of Avira Prime at no cost. Enter an email address and click “Email me Avira Prime” button to get exclusive access to all premium services. An email from Avira will received containing with download link and license key. Follow email instruction to complete the process and enjoy the free 3-months subscription of Avira Prime. Avira Prime supports up to 25 devices for Windows, Mac, Android and iOS operating systems.